It has always been Sonia Sanchez the poet I’ve known and loved, with strong works like Wounded in the House of a Friend, Does Your House Have Lions?, and Like The Singing Coming Off the Drums. Sonia the poet, a towering figure in my mind when I think of the powerful black woman poets that still get me through this life and inspire me to write. But there is Sonia Sanchez the playwright too, and I’m so glad to meet her in this critical new collection I’m Black When I’m Singing, I’m Blue When I Ain’t and Other Plays. This collection finally brings together all of Sanchez’s dramatic works, previously published and unpublished, spanning from 1969 to 2009. 1974’s Uh, Uh; But How Do It Free Us? is a play that only a woman with a deep love for her people and a real desire to save them could write. It painfully shines a light on the damaging effects of addiction and the open degradation of women in the militant black community. The play is broken into three groups of characters, each with different stories that reflect the problematic behavior prevalent at the time yet often hiding behind “revolutionary” rhetoric. In “Group II” we meet five men riding white rocking horses who revel in physically and verbally abusing two women, “White Whore” and “Black Whore.” Although the men proclaim to espouse revolution and progress, they are abusers as well as slaves to their drug addictions and sexual appetites. Sanchez’s love for the women who suffered during this period is honored in the 1969 play Sister Son/Ji. Son/Ji is eventually left alone to deal with the consequences of her commitment to a movement that, as Sanchez says “cannot catch her when she falls down in midnight solitude.” There were women who lost their minds as a result of choosing such a life, she says. Women like Son/Ji who threw themselves into the cause even while losing their children to war. In one of the book’s two essays, “Poetry Run Loose,” Sanchez lifts up Son/Ji as one who survived many years of death and sacrifice and chooses to speak in spite of her scars. Placing these plays within their historical context is important, but they also hold up today as dramas that uplift and motivate their audiences and readers, dramas with messages that are still valuable. 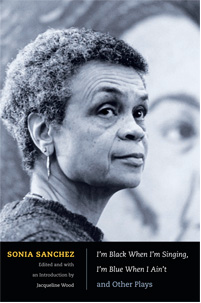 As this collection reminds us, there is Sonia Sanchez the activist too. Great review Natalie. It is always great to read your work. It's also good to be reminded that although Sonia Sanchez ia an amazing poet her activism and love for our people should shine as well. I'm embarrassed to say I hadn't had a sit-down with Sonia in a long while. However, your wonderful review makes me need to re-visit the old but always relevant, and see the new for myself. Thank you. Great review i really enjyed reading it. Keep up the good work. "... did i know where i was going? traveling. i'm always traveling(Sanchez)." Ms, Maxwell your review of such a profound cosmic sister is mind blowing. A fan and student of the art, Queen Sanchez reigns as a sturdy and prolific playwright in a world of flimsy faux expressions. The above quote hails from 'Poem At Thirty' as it appears in Nikki Giovanni's "The 100 Best African American Poems." Your devotion to detail and reverence of the material are equivalent to a Tibetan monk's attention to the most sacred texts. I am inspired, awed, and motivated by the voices rising in this review. I am convinced I need to subscribe, thank you for sharing your wonderful talent and this information. I will be purchasing this one. Smile on & keep writing! Thanks for preparing us for a timely piece of literature and urging us to continue to support one of the finest poets on the planet. Thanks! You made me realise that it's about time I heard about Ms Sanchez and started reading her work.